God’s Great Love forYou, was written by New York Times bestselling author Rick Warren. 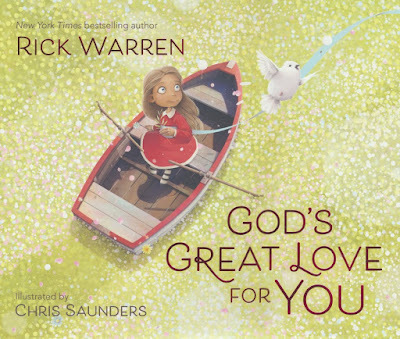 It takes children on a little journey that helps them understand God’s love is with them wherever they go. I love the adorable illustrations by Chris Saunders. They are cartoonish, yet still somewhat realistic-looking. Beautifully done and very appealing to young children. The book is a short read, with a few simple-to-understand words. Great to use while snuggling with a young child. The only thing I would personally change about it is where the book says God's great love for us is perfect "on good days, and bad days." I totally understand what this means, and I think most kids will understand it also. It helps kids realize God is with them and loves them no matter what kind of day they are having. But, for me personally, I try not to refer to any day as a "bad" day. To me, every day is a gift from God and, therefore, it is not a bad day. So, if I were to read this book to a young one, I would use the words "hard days" in place of "bad days." But, like I said, that is just a personal preference and not something to keep you from reading the book. You can find it available for purchase at Amazon, Barnes & Noble, Christian Book, and Lifeway. Disclosure: Thanks to Propeller/FlyBy Promotions, I received a sample of this book in exchange for my honest review and post. All opinions expressed are my own.